Bear Lake Community Needs YOU! Mark your Calendars-Important Informational Meeting January 9, 2012 @7:30 PM at the Bear Lake Township Hall, corner of Virginia Street and US31. Sign Up Here! On January 9th, 2012, we invite you to an information meeting about the new CERT program for Bear Lake, Michigan. 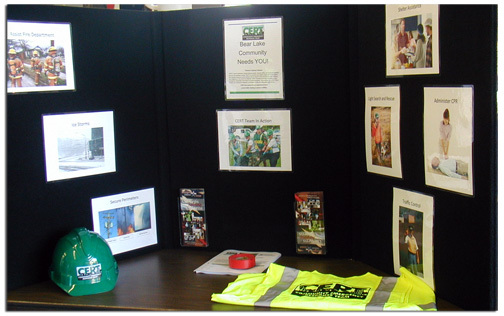 CERT stands for Citizen Emergency Response Team. Citizens helping Citizens, CERT, is about readiness, people helping people, rescuer safety, and doing the greatest good for the greatest number. CERT is a positive and realistic approach to emergency and disaster situations where citizens will be trained to help themselves, their families and neighbors in the event of a disaster. CERT volunteers will learn the skills to help emergency responders save lives and protect property. As a member of the Bear Lake CERT Team, citizens can respond to disasters, participate in drills and take additional training. CERT has a place for you regardless of your current skills, training or physical abilities. Sign Up Here! The Bear Lake Township Board has unanimously approved the creation of the Bear Lake Township Community Emergency Response Team (CERT). 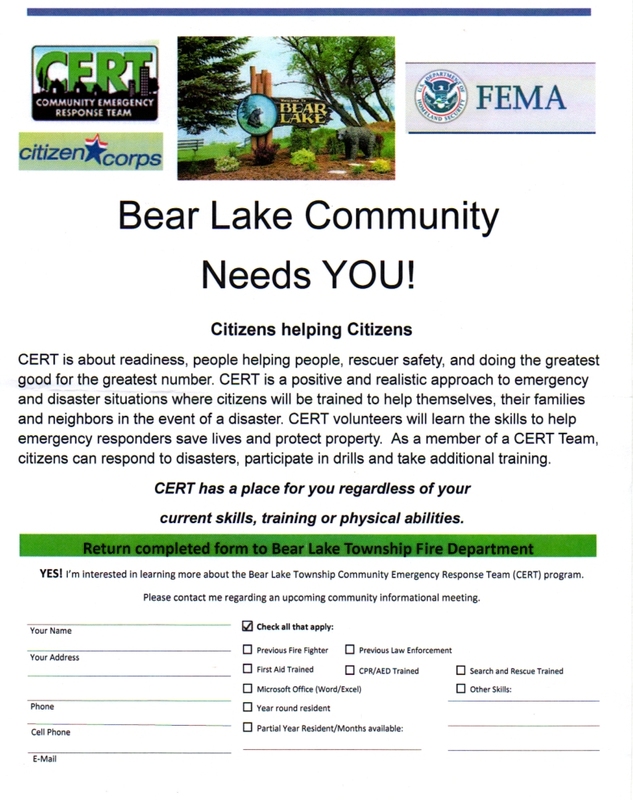 The Bear Lake Township Community Emergency Response Team (CERT) is a group of citizen volunteers created by the Bear Lake Township Board to be a component part of and to assist the Bear Lake Township Fire Department. The CERT Program is part of the local and national Citizen Corps effort to incorporate and utilize volunteers in the community. Sign Up Here! Citizen Corps is endorsed by the President of the United States and the Department of Homeland Security. Bear Lake Township CERT members are trained in basic response techniques in order to assist local citizens and first responders in disaster or emergency situations. CERT Mission Statement: TO PROVIDE AREA RESIDENTS AND FIRST RESPONDERS A QUALITY RESOURCE FOR SAFETY EDUCATION, HAZARD MITIGATION, EMERGENCY RESPONSE ASSISTANCE, AND OTHER VOLUNTEER EFFORTS. Bring your friends, bring your neighbors! Join us on January 9,2012 at 7:30 at the Township Hall to learn more about becoming involved and giving back to your community. For more information, please contact Larry Gibson, CERT Coordinator at ljgibson.emops@gmail.com Sign Up Here! See you on January 9,2012! The Community Emergency Response Team (CERT) Program educates people about disaster preparedness for hazards that may impact our area and trains them in basic disaster response skills, such as fire safety, light search and rescue, team organization, and disaster medical operations. Using the training learned in the classroom and during exercises, CERT members can assist others in our neighborhood or workplace following an event when professional responders are not immediately available to help. ← Be Safe Bear Lake!